“Many people misunderstand the purpose of the spiritual warfare Job experienced (Job 1-2). The point of Satan was not to destroy Job or ruin his life by destroying his family and property. Satan’s desire was that Job would curse God for letting such bad things happen to him. Sadly, Job’s wife became so exasperated that she fell right into Satan’s hands when she said to her husband, “Do you still hold fast to your integrity? Curse God and die!” (Job 2:9) Thankfully, Job kept his spiritual integrity and would not blame God for his troubles. “The point is this: Satan’s primary purpose is to make God, not us, look bad. But he attacks us in order to tempt us to attack God. And he will use any situation at all–just as he did in Job’s life–including our finances and economic health. 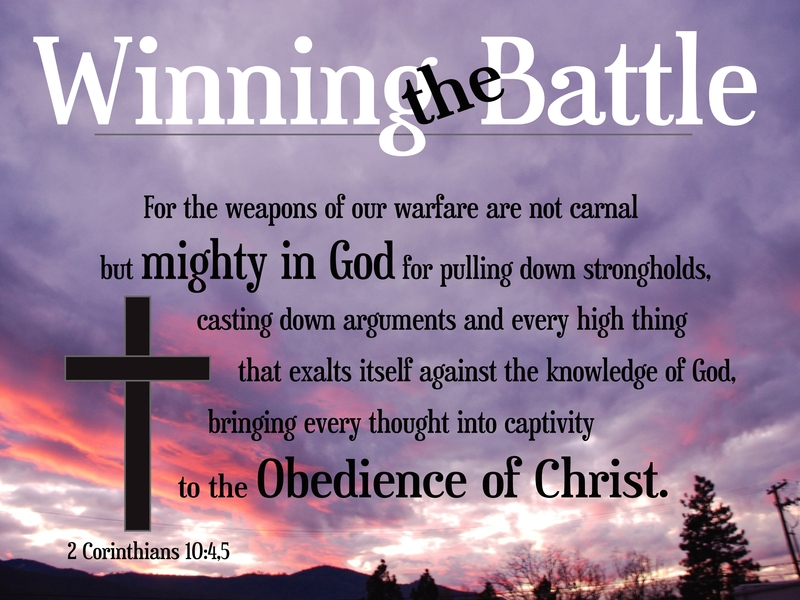 If you can become so anxious over the economy or money that you lose your faith in God, Satan has won the battle. We win by giving thanks in everything (1 Thessalonians 5:18) [emphasis mine]. “Shall we accept good from God, and not trouble?” Ah, “there’s the rub” as Shakespeare’s Hamlet once said. We have no problem accepting good from God, but rail at Him when trouble comes into our lives. However, trouble is most often sent to correct us, mature us, get us back on the right track, and broaden our spiritual perspective on what this life is really all about. And sometimes, like Job who did nothing wrong to bring about his devastating circumstances, it is a test. Of all the “troubles” that enter our lives, money issues are at the top of the list and cause us more grief then just about anything else. And depending on the priority we have personally given to money, it affects everything else including our relationships with other people and definitely our relationship with God. For example, do you know what the #1 cause of divorce is in this country? According to an article published on voices.yahoo.com by Maxwell Payne titled, “The Most Frequent Cause of Divorce,” the #1 cause is financial–in other words, money. As Jesus said in Matt. 6:24, “No one can serve two masters. Either he will hate the one and love the other, or he will be devoted to the one and despise the other. You cannot serve both God and Money.” Yet, we try to do it all the time whether we recognize the struggle or not. Most people place far more emphasis on making money and keeping track of their financial portfolios and retirement plans then they do on God and what Jesus has to say about where our emphasis should be–“But seek first his kingdom and his righteousness, and all these things will be given to you as well” (Matt. 6:33). Unfortunately, we get it reversed all the time and money ends up replacing God in our lives. And it’s idolatry . . . and it’s deadly. Job was one of the most prosperous men on earth at the time his significant troubles hit him, but he did not place the emphasis of his life on his money or his possessions or anything else. He placed his life squarely in the hands of God. And, unknown to him, his significant troubles, which had nothing to do with anything he had done wrong, started as a result of a cosmic exchange between God and Satan (Job 1). In the flash of an eye, he lost everything . . . EVERYTHING! It was a test of monumental proportions. Even his three friends and his own wife didn’t understand what it was all about and his wife even told him to “Curse God and die” (Job 2:9). But he never did. His response to her was, “Shall we accept good from God, and not trouble?” (Job 2:10) and he held on to God. Because we are human and our understanding is so incredibly limited, at the first sign of trouble in our lives we react many times with the question, “Why did this happen to me, God?” And depending on where our focus is, we either wallow in the misery of it and try to figure it all out on our own, or we can give it back to God and allow Him to use it and change us in the process. Job was just as human as we are, and while what happened to him was absolutely devastating, he did not complain but chose to keep his focus on God and to wait on Him. It was a test . . . and while it was a devastating test, Job passed it because he never lost his focus on God and did not focus on his circumstances at any point during his trial. And in the end, “The LORD blessed the latter part of Job’s life more than the first” (Job 42:12). There is another issue that ties into this one that I want to touch on, and that is the issue of faith. Many times in my life I’ve heard Christians say (and I have said it myself), “I just wish I had more (or enough) faith,” for whatever it was they really needed faith for in order to overcome a difficult situation. And many times instead of waiting on God, they rushed out ahead and tried to solve their problem in their own power, sometimes with devastating results. They didn’t wait on God and took matters into their own hands, and they missed out on what God had in store for them. I’ve been there and you probably have been, too. The Apostle Paul states in Romans 12:3, “For by the grace given me I say to every one of you: Do not think of yourself more highly than you ought, but rather think of yourself with sober judgment, in accordance with the measure of faith God has given you” [emphasis mine]. Part of the problem of waiting on God in the midst of our trials is that we really do think more highly of ourselves then we should and not with “sober judgment” according to the measure of faith God has given us. Clearly, God has given each of us a measure of faith that we can use with “sober judgment” (discerning the difference between either going after what we want in our own power or waiting on God to give us what He wants in His power and timing). Therefore, if we are truly Christian, it is an oxymoron to say “I wish I just had more (or enough) faith.” God has given all of us a “measure of faith” and it’s the right amount we need to leave all of our circumstances in His hands. Our problem is that we don’t exercise the faith that He has already given to us, and we operate on “sight” instead. Our faith cannot grow if we don’t exercise the faith He has already give us when trials and tests come into our lives. We must learn to keep our hands, eyes, and understanding off of our trial and keep them on God and trust in Him totally to work things out according to His plan and His timing . . . Period. And by doing that, our faith will grow and His purpose for our lives will unfold according to His will and not ours. And we might be absolutely amazed at what He brings into our lives if we are faithful to leave the circumstances of our trials in His care and wait for His timing to bring us out of them for His glory and not our own. So the next time you face a trial, whether big or small, remember that it is really a test. Do you want your own way, or do you want God’s best? “Trust in the LORD with all your heart and lean not on your own understanding; in all your ways acknowledge him, and he will make your paths straight” (Prov. 3:5-6). “This is a test. It is only a test.” So go out there and pass it, in His strength, and not your own understanding.